I had several parts in a single document and used them to build an assembly in other document. After building the assembly, I decided that I wanted to put some of the parts in their own documents (to start building out a part library). However, after moving the parts to their own document, I don't see any way to tell my assembly that the parts still exist, but just in a new location. Is there any way I can link my assembly to the parts in the new document without rebuilding everything manually? You should at least see a linked document icon on the parts. Even though the link icon is not blue you can right-click to change the reference and Onshape knows that you moved the part to a new document and will give you a link to press to carry the reference over. The assembly should just know where those parts were moved to - are you not seeing this? What happened to the assembly? When I open the assembly, I see the little blue icons. So, I right-clicked and selected update to latest version (I did this with the first item in the list). After updating, the item turns red and I get a message the says "has error: Failed to resolve element" when hovering over the part. @bradley_sauln - When I try to update the linked parts, I don't see the same blue box you're showing in your picture. 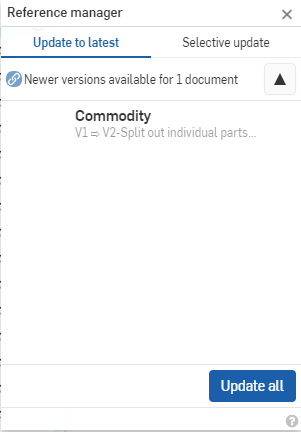 I'm just prompted to update to a new version of the document that doesn't hold the part anymore (V2). At step 7, click on the link as shown in Brad's post above to rectify the issue. It is not clear immediately what the issue is and I agree the wording should be clearer. @NeilCooke - I think we were typing at the same time. For some reason, I'm not seeing the same "update to new document" link that @bradley_sauln shows in his picture. 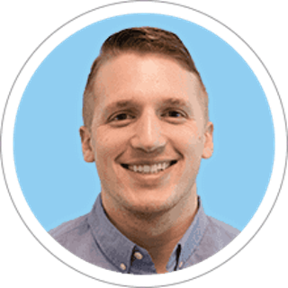 @tim_hess427 - can you rollback your assembly and try again? I tried it from scratch and it worked ok for me. 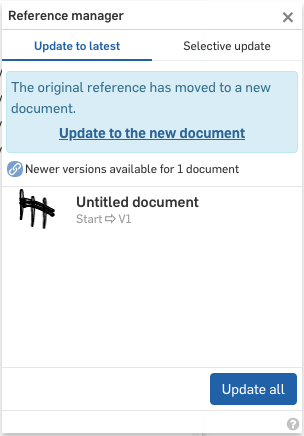 I have rolled the assembly back and tried updating the parts again, but I still don't see the "Update to new document" option. I replicated the same process using a different assembly and different parts, and this time I DID see the "Update to new document" link, like you show. I even tried this with different combinations of creating versions, not creating versions, moving things in a different order, moving things to different folders, etc, and it worked correctly every time. So, it looks like I'm either accidentally doing something wrong or found some sort of bug. 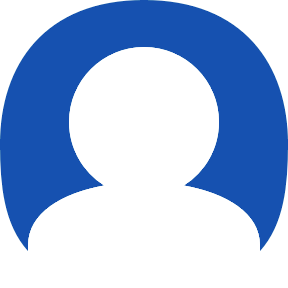 @NeilCooke and @bradley_sauln - I have submitted feedback and shared my document with support through the app. I'll mark this question answered as it looks like I'm either doing something incorrectly or encountered a bug. Either way, it looks like there is a way to link to a new document when a part moves, which is what I needed to know!